Brandon McCarthy has a major twitter obsession. He's on it all of the time. Like, ever waking minute... OK, maybe I'm overstating that a bit. McCarthy isn't always on twitter, but it sure seems like it sometimes. 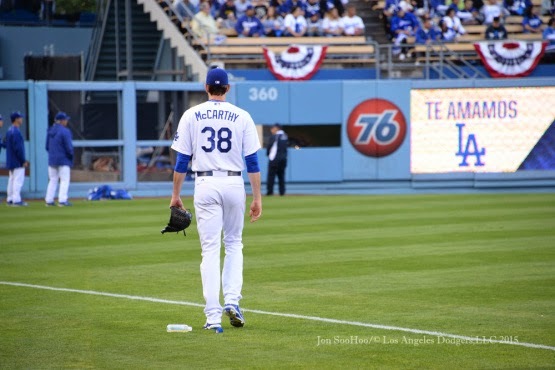 From the funny jabs at his teammates to a willingness to communicate directly with fans, Brandon McCarthy is certainly the loquacious sort on twitter, and it's clear Dodger fans love every minute of it. After all, what fan doesn't want to know the personalities behind the players on your team. I felt the same way after wisdom tooth surgery many moons ago. I haven't seen it and I don't plan on rushing to the theater now. Hey, Brandon! How many pills do you have left? ESPN writer Chris Jones shares the perfect response below. @BMcCarthy32 Imagine how your bath feels. We will no doubt be enjoying many more hilarious tweets from the man over the coming months, so be sure to give Brandon a follow here: @BMcCarthy32. I guarantee you won't regret it.